Pioneer SC-LX88 review | What Hi-Fi? Pioneer goes from strength to strength. The SC-LX88 carries all the hallmarks of a top-end Pioneer receiver – fast, precise, superb layers of detail – and adds a powerful dose of muscle to make things even more exciting than before. That surge of power isn’t the only exciting aspect of this £2200 nine-channel home cinema amplifier. Alongside the extensive streaming, connectivity and file compatibility, the SC-LX88 features Dolby Atmos. We dive straight into Atmos mode with a Blu-ray of Transformers: Age of Extinction (there are more titles coming with Atmos soundtracks, but we have to contend with this Michael Bay sequel for now) – and are blown away by just how fluid and dynamic Atmos sounds. The soundfield opens up, the added speakers give a serious sense of height, and the way Atmos is encoded means that objects move around the room more organically than before. It’s subtly done. Effects don’t jump out at you from above, instead Atmos simply allows a bigger, more spacious soundfield. You get the sense of drones and helicopters sweeping from the middle of the room and hovering above. Bullets ricochet through you rather than around the outskirts of the room where speakers are positioned. And distant chirps of birds really do feel distant and located somewhere above rather than, say, in the front-right speaker. It’s a powerful sound and hugely immersive. It takes us switching down to a standard 5.1 or 7.1 Dolby TrueHD soundtrack to truly appreciate how much Atmos adds to the cinematic experience. The sound is suddenly smaller and you’re aware of the height limit imposed by your ceiling. But that doesn’t mean the Pioneer is a slouch with standard 5.1 or 7.1 set-ups. Its core performance is stunningly impressive and capable, Atmos or not. While it doesn’t sound as huge and grand as the Yamaha RX-A3040, the Pioneer amp gets everything else right. It’s punchy, taut, and agile. We love its crisp, clean sound and the razor-sharp precision with which it handles a film’s soundtrack. It has a satisfying, meaty punch. With X-Men: Days of Future Past playing, we’re sucked into the action from the get-go. There are layers of punchy detail keeping us captivated with every scene and line of dialogue. Voices are clear and direct (unlike the Yamaha) and packed with character, even at lower volumes. The SC-LX88 has a wonderfully even tonal balance – highs sparkle with no hint of brightness, while the low end rumbles with insight. There’s depth and complexity to Magento’s metal-bending, excitement to the prison break scene, and the beautiful melody of Jim Croce’s Time In A Bottle in the slow-motion kitchen scene is stunningly immersive. Pioneer hasn’t labelled the terminals for Atmos speakers clearly, so you’ll have to run the set-up and use the on-screen graphics to make sure the speakers are plugged into the right terminals. We discovered the Atmos speakers need to be plugged into the ‘surround back’ and ‘front wide’ terminals. In the speaker system menu, choose the 5.2.4 option for a standard 5.1 speaker package layout with four added Atmos speakers. This works for a 7.1 system, too, although you can opt to use the 7.2.2 layout if you want to add only two Atmos speakers to your existing seven speakers. You can then assign ‘Dolby Sp’ status to the added Atmos speakers in speaker settings. Finally, make sure your Blu-ray player audio output is set to ‘bitstream’ (not PCM) before you start playing an Atmos Blu-ray disc. 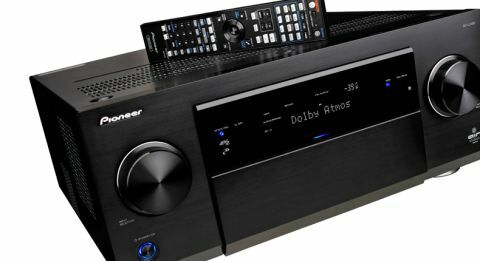 Pioneer’s acute grasp of rhythm and punch lends itself well when playing music. With a live concert on Blu-ray, the Pioneer delivers the plucks, twangs, thumps and vocals with plenty of style and perhaps a bit more oomph than necessary. We’ll take that extra solidity over a thin, coarse sound any day. Playing songs through USB sounds more solid and cohesive than Bluetooth, although both have a decent sense of excitement, detail and agility. Make sure you’ve switched to stereo mode when listening to music – it makes songs sound more focused. If you’re aiming for long listening sessions, though, we would still guide you towards a dedicated stereo amplifier. Befitting a flagship product, the SC-LX88 has an exhaustive selection of streaming features and connections. Apple users can stream using AirPlay, while Spotify Connect and internet radio provided by vTuner opens up a world of music discovery – you’d be hard-pressed to run out of things to listen to here. AptX Bluetooth is built into the SC-LX88, and there’s a type-B USB input for directly connecting your laptop. Wired and wireless connections are available (both are stable) and you can, of course, play songs stored on any NAS device or laptop plugged into your home network. File support is extensive, with high-resolution 24-bit/192kHz WAV, FLAC and AIFF files playable via DLNA and USB. It also supports DSD files. There are eight HDMI 2.0 inputs and three outputs, all capable of playing Ultra HD 4K and 3D content. SACD discs are also supported, and there’s even a phono input for your turntable. Neat, sleek and a great hulking mass of metal – the Pioneer SC-LX88 ticks all the right design boxes. Available in black or silver, the SC-LX88 is beautifully machined, sturdy, and its large display is pin-sharp and easy to read. The dials are responsive and lovely to use, too, as is the responsive remote-control wand. We just wish the Pioneer came with clear instruction on how to get Atmos speakers up and running with the amp – you have to explore the manual speaker settings. Our biggest complaint is that the back of the panel doesn’t state which terminals are for Atmos speakers. That apart, we can’t stop praising the SC-LX88. It strikes a mature balance between subtlety and power, and offers a wealth of features that blow away the competition. It has a captivating sound that will keep you entertained for hours.